Scenarios put your learner in the real-world situation of your choice—that’s instant engagement. You can create any scenario you imagine, from a basic simulation to a complex experience that serves as the entire course. As your scenario development becomes more complex, you might need to take additional time to plan ahead and organize the e-Learning course. That’s where storyboarding comes in! Storyboarding is a visual way to organize all aspects of development. For your learners, this is a chance to make decisions that they will later make on the job. Through your scenario, they’re able to practice new tasks in a comfortable environment. If they make a mistake, they’ll learn the consequences—but before they’re actually stuck in a bad situation at work. When you’re storyboarding a scenario, feel free to include multiple paths; sometimes there’s more than one solution to a problem. Like in a play, if you make the dress rehearsal as close as possible to the actual performance, your learners will be able to make the most of practice time. The more complex you make a scenario, the more of a hassle it is to go back and make adjustments that your subject matter expert recommends. Storyboarding allows you to show your SMEs what you’re thinking and involves them in the planning process. For example, if they see a path that doesn’t work, they can tell you before you waste time creating the actual course. To get more help with SMEs, read this blog post: Working with Subject Matter Experts. A storyboard is like your script—use it to guide you as you’re developing. Use the storyboard phase to test out different “plot lines” in your scenario, so you’re not creating a mess during the development stage. That wastes everyone’s time, including yours, and your team won’t appreciate that. Learning objectives keep you on track as you’re creating the storyboard—and the scenario. Sometimes it’s easy to get carried away adding extra paths just for fun, especially in the storyboarding phase. That’s why it’s important to define your learning objectives early, and add them to your storyboard as a reminder. If you want more info on writing learning objectives, this blog post is a great one: 4 Tips for Creating Effective e-Learning Objectives for Yourself. 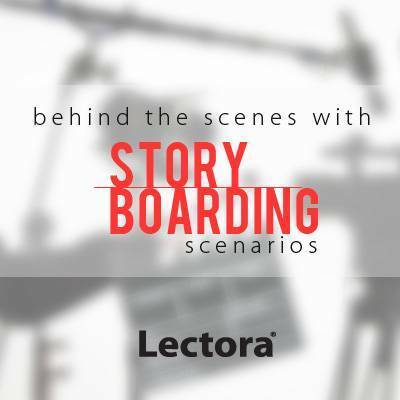 Now that you have a behind the scenes look at storyboarding scenarios, you’re ready to use these tips to storyboard your next complex scenario. For more tips on creating scenarios, read this blog post: Building Scenario-Based e-Learning Courses. Want a list of helpful storyboarding resources, including a video and white paper? Check out this post: Thursday’s Trending e-Learning Topic: Storyboarding.